Are you looking for an IaaS public cloud provider that offers you more than naked infrastructure? Do you fear getting surprised by unexpected monthly network charges, complexity, highly limited features and disappointing integration with your existing infrastructure? Are you nervous the cloud vendor you’re considering doesn’t have a long track record and may not survive the next industry shakeout? Would you benefit from 24/7 customer service, but don’t want to ransom your first born? 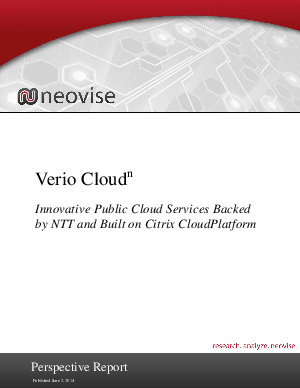 Cloud(n) is a public cloud solution developed by NTT, one of the largest telecommunications companies in the world, and delivered by Verio, a US-based NTT Communications subsidiary with a 20+ year track record. Together, we have created a unique, flexible, reliable, customer-friendly IaaS solution backed by an experienced 24/7 customer support organization. With NTT’s vast global network, Verio offers powerful performance and pricing advantages; 99.99% SLAs, free bandwidth and fixed cap pricing so you can predict expenses. Verio provides an intuitive, easy to use Customer Management Portal, enabling you to spin up or spin down custom configured cloud servers in minutes. Build your cloud using industry standard templates or upload your own. Managing your infrastructure is made easier with built in load balancing, auto scaling, and monitoring capabilities. Cloud(n) is built upon the Citrix CloudPlatform providing developers with a secure, reliable, hypervisor agnostic foundation that scales and supports almost any workload. And, with an extensible API, the portal integrates with over 200 3rd party solutions, including AWS, so you can more easily share data and transition workloads between your Cloud(n) and other instances. You are not alone; Verio has well trained 24/7 customer support, and it’s provided at no extra cost with Cloud(n).